This lovely little dish showcases wonderful ingredients so easily available during the British summer. It’s really easy to make and there are some unusual flavour combinations that go so well together, you’ll wonder why you haven’t been eating strawberries, cheese and ham your whole life! In a bowl, drizzle the sliced strawberries with a generous glug of balsamic vinegar, the lemon juice and some extra virgin olive oil. Season with salt and pepper. This will draw out the flavour of the lovely strawberries. Preheat a large non-stick frying pan to medium hot and add a splash of olive oil. Press a basil leave on to each side of the halloumi and place the slices, leaf side down, in the frying pan. After one minute carefully turn over and cook for another minute or so until the cheese is light golden and crisp. To plate, place a couple of pieces of halloumi on each plate. Add the mint, the rest of the basil and the salad leaves into the bowl with the strawberries and toss together. 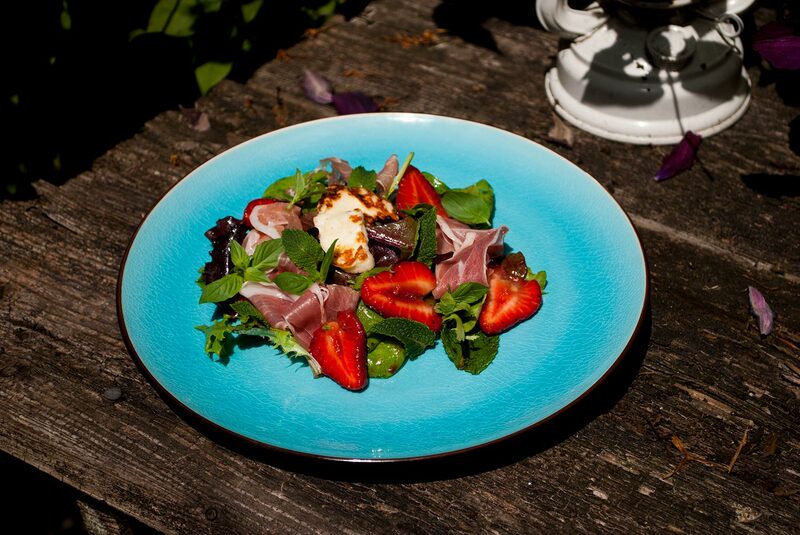 Pile some of the strawberry salad on top of the halloumi and then drape the Parma ham over the top. Finish with a few more salad leaves and an extra drizzle of oil and vinegar.